Now you can eat the pasta you love and maintain a healthy diet. Our pasta is GMO free and fortified with added vegetable protein. It has the taste you crave plus a smooth texture. Our cheese is real, with no synthetic dyes, colors or flavors. And, there’s more of it—more than any other national brand—so you get plenty of calcium, too. Combined, our high protein pasta and Real Cheese create a healthy and satisfying meal for all ages. 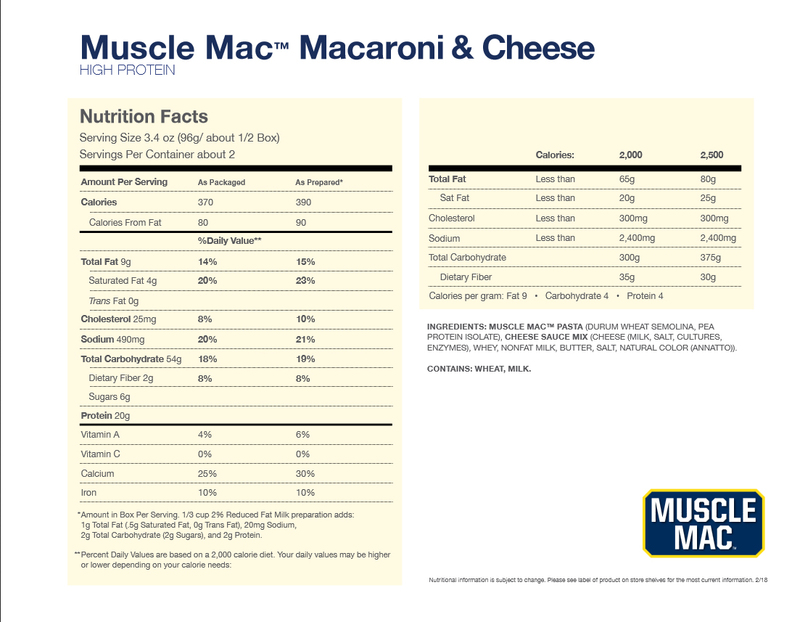 In fact, just one serving of Muscle Mac™ provides 42% of your recommended daily protein* intake. Looking for a convenient way to add protein to your diet? 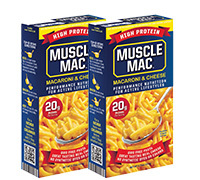 Try new Muscle Mac™, a wholesome and nutritious meal or snack that tastes great. Our combined ingredients deliver 20 grams of protein per serving. That’s more than double any leading national Macaroni & Cheese brand. Plus, 10% of the protein in Muscle Mac™ comes from plants, specifically peas, which is an affordable and healthy alternative to animal protein. Getting the right amount of protein benefits everyone—not just athletes. Sure, it provides energy for your workout and supports muscle growth and recovery. But it can also curb hunger and boost your immune system. A “macronutrient,” protein is used by the body to make enzymes, hormones and other essential chemicals and compounds. It plays a vital role in healthy hair, nails, bones, cartilage, skin, and blood, too. As you age, protein helps you maintain muscular health and it supports growth in children, teens and pregnant women. Whatever your age, a diet rich in protein can help keep you satisfied and on the path to well being.